but in the productivity statistics." Management analyses available information, makes decisions based on that analysis, executes those decisions and achieves an outcome. IT creates value in three ways: information (for making decisions), levers and controls (options for implementing decisions) and operations (efficiency and productivity). 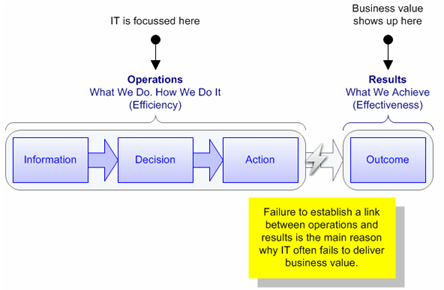 The reason why IT often fails to deliver business value is that there's no link between operations (information, decision making, actions) and results (outcomes). IT value is subject to the Opportunity/Traceability Paradox: the more value IT contributes, the harder it is to prove that IT contributed that value. The solution to the Paradox is a closed-loop performance improvement system – which allows IT to get involved early and trace the value it delivers. If IT's role is to help the organisation achieve its desired outcomes, CIOs need to truly understand how their organisation achieves those outcomes. Most CIOs would know the organisation's key performance indicators (KPIs), the organisational structure, the key processes and the business strategy. But in order to truly deliver value, CIOs need to dig deeper and understand the decisions that are made on a day-to-day basis. Organisation outcomes are really the sum-total of the decisions made, and the actions taken, in an organisation. Outcomes are not achieved by having grandiose missions, visions and strategies. Outcomes are achieved one decision, and one action, at a time. This article is describes how to develop a closed-loop performance improvement system that will help IT drive business performance, rather than merely enable it. The organisation's performance (and that of its management) is determined by comparing actual outcomes against desired outcomes (targets). Information. Providing better information to decision makers (the age-old 'right information, right person, right format, right time' cliche). Levers and Controls. Giving management additional (or improved) levers and controls. Operations. Improvements in the way the organisation operates. Delivering better information to decision makers clearly adds business value. Knowledge management and business intelligence initiatives are typical examples. Making decisions is about choosing from among a set of alternative options. Giving management more options clearly adds business value. Levers and controls are those 'options'. To illustrate the concept of levers, consider driving along and a person steps onto the road in front of you. Based on that information ('there is a person on the road') you need to make a decision. But you can't decide to 'avoid person' – that is an outcome, something you can't directly control. The decisions you can make are limited entirely to the options (i.e. levers and controls) you have at your disposal. You can swerve (steering wheel), you can brake (brake pedal) or you can do both. There are no levers or controls that let you fly – so that is not an option you can exercise. Based the levers you decide to use, the car will behave in a certain way (Action) and you either avoid the person or hit them (Outcome). Managers have countless levers at their disposal which they use to affect the 'Actions' in an organisation and ultimately its 'Outcomes'. Many levers, such as changing reward and recognition systems, rebranding, changing marketing mix, and the like, have nothing to do with IT. But in our information technology based world, more and more levers have an IT component. Creating new levers. New levers give management new options - allowing them to do things that they couldn't do before. IT can be a foundation for developing new organisational capabilities which management can employ in achieving desired outcomes. For example, new collaboration tools give managers options about how to organise staff (since they no longer have to be in the same office) and the level of interaction the organisation has with their business partners (since the tools make it possible to have close, real-time collaboration). An identity and access management (IAM) solution gives management the ability to increase and decrease temporary staff numbers quickly in response to changing business demand. A business process management solution allows management to quickly reconfigure automated business processes. Improving existing levers. IT can improve many existing organisational levers. Consider a simple lever like 'sales commission' which is used to affect the actions of salespeople (and therefore sales outcomes). In its simplest form, sales commission is calculated as a percentage of sale proceeds, at the time of sale. With modern IT, it's possible to calculate sales commission in far more sophisticated ways. For example, salespeople could be rewarded based on the lifetime value of a customer. This would give management the option of rewarding based on the long-term quality of customer rather than short-term sales volumes. Improving operational efficiency and productivity clearly adds business value. This is the value category that closely aligns to the core strengths of most IT Departments. Focus only on results. Business cases often claim that costs will be saved and customers will be more satisfied without articulating how those outcomes will be achieved. You can't affect outcomes directly – outcomes are merely the end result of actions taken. If you can't describe what operational actions must be taken to achieve the stated outcomes, chances are the expected value won't be delivered. Focus only on operations. IT is comfortable being an 'enabler' because it absolves IT from any responsibility for outcomes (results). Peter Drucker once said that "there is nothing so useless as doing efficiently that which should not be done at all", yet IT often focuses on operations without explaining how operational changes will affect outcomes. Information is not useful or timely for making decisions. IT often concerns itself with capturing, transmitting, transforming and displaying massive quantities of information, but much of it can be classified as 'interesting but irrelevant'. As Einstein once said, "not everything that can be counted, counts." The levers and controls available to management to implement decisions don't have a direct and predictable affect on actions. If the levers and controls that management has at their disposal are only loosely connected to organisational outcomes, it's like driving a car whose steering wheel is loosely connected to the wheels. The organisation doesn't operate in a way that can deliver desired outcomes. If, for example, the desired outcome is to become a high margin, differentiated, innovative organisation then this outcome won't be achieved if operations are optimised for low-cost. The paradox of IT business value is that the more value IT contributes the harder it is to prove that IT contributed that value. Opportunity. When IT gets involved at the 'Action' stage there is little scope to add significant value. After an initial flurry of automation and process reengineering, incremental year-on-year improvements in efficiency and productivity aren't going to have huge impact on business outcomes. When IT gets involved at the 'Information' stage there's an opportunity to provide strategic insights which could lead to game-changing initiatives. Traceability. When IT gets involved at the 'Action' stage and delivers value through efficiency and productivity improvements it is relatively easy to trace the business value. Reductions in cycle times, costs, and headcount all feature heavily in business cases. 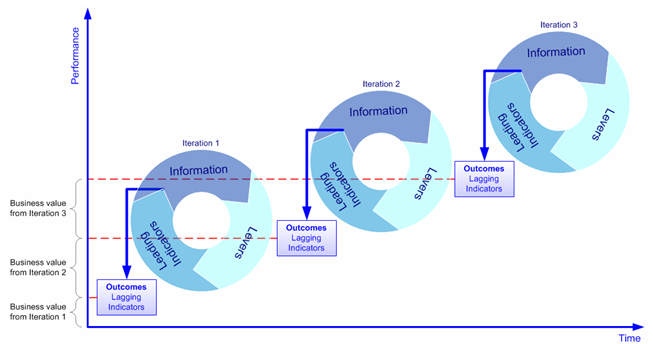 When IT gets involved earlier, at the 'Information' stage it is far harder to trace improved business outcomes to the information delivered (there are a lot of variables in play between initial information and eventual outcome). Maybe business executives are doing themselves a disservice by inadvertently backing IT into the 'Action' corner. There's nothing wrong with asking IT to demonstrate value, but the constant pressure to do so often means that IT doesn't have any incentive to look elsewhere for value – knowing that it won't be able to prove its contribution even if it does find it. Some middle ground between business and IT needs to be found. Leading indicators. Leading indicators predict the future. They are the organisation's 'vital signs'. A critically ill hospital patient may be wired up to various monitoring devices which show the patient's vital signs, and allow doctors to predict the patient's future (if the vital signs are improving then the patient will probably recover). In the business world, the number of contract negotiations is a leading indicator of sales, and the number of known software bugs in the latest release is a leading indicator for the number of help desk calls expected. Lagging indicators. Lagging indicators show what has happened in the past. While leading indicators are 'vital signs' which allow organisations to take corrective action before it's too late, lagging indicators can only be used for 'post-mortems'. The greater the gap between a leading indicator and the associated outcomes, the more time the organisation has to take corrective action. Staring at the 'Action' stage (where most IT Departments are most comfortable and most capable) IT should 'instrument' the business so that meaningful leading key performance indicators (KPIs) are produced. Those leading indicators will predict outcomes (lagging indicators). Information from leading indicators will generate relevant data for the 'Information' stage. IT's job here is to deliver that information to the relevant decision makers, in a timely manner and in a consumable form. In the 'Decision' stage, managers will act on the information. IT's job here is to develop management levers that will allow management to action their decisions. These levers should have a direct and predictable affect on the Actions in an organisation, actions that will be measured by the leading indicators (which in turn predict the lagging indicators which measure outcomes). It is important to focus on each of the three components of the cycle. To be successful at their chosen sport athletes hone ALL the skills required to perform and succeed – they don't just work on things they like or on things they're good at. You can't be a champion golfer if you can't putt or a champion tennis player if you can't serve. An athlete's overall performance is dictated by their weakest link. And so it is with IT Departments. Each IT Department has a unique set of capabilities and it's only natural to focus on things you're good at, but that temptation must be avoided. In order to drive business value IT must understand how the organisation produces outcomes. A high-level understanding is insufficient. To truly add value, IT must understand the key decisions that are made in the organisation, what information is needed to make them, what management levers and controls are needed to implement them and finally the relationship between those levers and controls, and eventual outcomes.